AMMONNEWS - Partial results show that Turkey's ruling Justice and Development (AK) Party is in the lead in Sunday's local elections seen as a test for President Recep Tayyip Erdogan amid concerns over the country's economy. With 75 percent of the provincial votes counted as of 10pm (19:00 GMT), the AK Party-led People's Alliance had secured 52.2 percent of the votes countrywide, according to state-run Anadolu Agency. It was followed by Nation Alliance, a coalition led by the main opposition centre-left Republican People's Party (CHP), with 37.2 percent. With 88 percent of the votes counted In Istanbul, the country's largest city and economic centre, Binali Yildirim, the candidate of People's Alliance and a former prime minister, was in the lead with 49.7 percent of the votes. Ekrem Imamoglu, the Nation Alliance candidate, had 47.6 percent. In the capital, Ankara, preliminary results showed that Nation Alliance candidate Mansur Yavas had garnered 49.9 percent, with 78 percent of the votes counted. He was followed by People's Alliance nominee Mehmet Ozhaseki, with 47.8 percent. 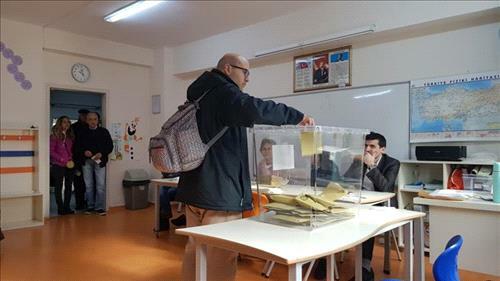 In the third-largest city, Izmir, the Nation Alliance candidate Mustafa Tunc Soyer was in the lead with 58.2 percent of the votes. Nihat Zeybekci, the candidate of Erdogan's bloc, had 38.2 percent. Seventy percent of the votes have been counted. The polls were seen as a major challenge for Erdogan and his party given a backdrop of high inflation and rising unemployment sparked by a major currency crisis last year. Earlier this month, fficial statistics showed that in the last two quarters of 2018 the Turkish economy slipped into its first recession in a decade, as inflation and interest rates soared due to the currency meltdown. The AK Party entered the race with its ally in the last two polls, the far-right Nationalist Movement Party (MHP), under the People's Alliance. For its part, CHP joined forces with the right-wing Good (IYI) Party in the Nation Alliance. Both blocs fielded dozens of joint candidates in the country's provinces, districts and towns. Ayse Kara, a 40-year-old voter in Istanbul, said she cast her ballot taking into account the stability of the country. "I considered the economy and terror as the main issues while casting my vote. I believe everything will get more stable after the elections," Kara, who works in manufacturing, told Al Jazeera. Ilke Beltinge, a 25-year-old student, said she did not like the country's current direction. "I cast my vote for more freedoms, a better economy and a better educational system. And I hope that we will see change following these polls," she told Al Jazeera at an Istanbul polling station. Two people were killed in the eastern province of Malatya, and dozens of others were wounded in various provinces of Turkey in fights that broke out in the voting process, state media reported.